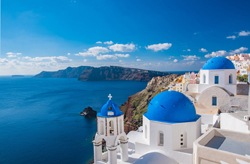 With well over a hundred inhabited Greek islands and a territory that stretches from the south Aegean to the Balkan countries, Greece offers enough to fill months of travel. The historic sites in greece span four millennia, encompassing both the legendary and the obscure, where a visit can still seem like a personal discovery.Greek beaches are parcelled out along a convoluted coastline equal to France's in length, and islands range from backwaters where the boat calls twice a week to resorts as cosmopolitan as any in the Mediterranean. 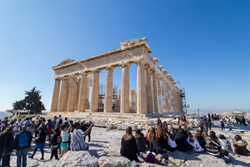 Of course there are formal cultural greek activities for your travel as well: museums that shouldn't be missed, magnificent medieval mansions and castles in greece, as well as the great ancient sites dating from the Neolithic, Bronze Age, Minoan, Classical, Hellenistic, Roman and Byzantine eras. Greece hosts some excellent summer Greek festivals too, bringing international theatre, dance and musical groups to perform in ancient theatres, as well as castle courtyards and more contemporary venues in coastal and island resorts. But the call to cultural duty will never be too overwhelming on a Greek holidays. The hedonistic pleasures of languor and warmth - going lightly dressed, swimming in balmy seas at dusk, talking and drinking under the stars - are just as appealing. And despite recent improvements to the tourism "product", Greece is still essentially a land for adaptable sybarites, not for those who crave orthopedic mattresses, faultless plumbing, Cordon-Bleu cuisine and attentive services.Greeks spend a lot of time socializing outside their homes, and sharing a meal is one of the chief ways of doing it. The atmosphere in greece is always relaxed and informal, and pretensions (and expense-account prices) are rare outside of the more chi-chi parts of Athens and certain major resorts. On many Greek islands and cities there will be both hotels and rooms for rent in your travel. The latter will be in someone's house. You'll see references to pensions, which are supposed to refer to rooms for rent, but I've seen the name applied to low scale hotels as well. Compared to hotels, rooms are much cheaper, may actually be bigger, and sometimes with kitchen facilities as well, but can be awkward to get at, not so private, or have less facilities and services. Greek hotels are rated. The classes, from best to worst, are Luxury hotels, A, B, C, D, and E.
The hotels classes are generally accurate, allowing that a given grade of hotel in the rural area will be less well equipped than the same class in Athens. A C class hotels will be simple, clean, neat, safe. Despite what the guidebooks say, I've found them to have bathrooms in suite. They typically do not have air conditioning in hotels, sometimes will have in room phones and TVs. Breakfast will be simple, cost extra or not be available. The bathroom will be very small, the floor often doubling as the floor of the shower. Rooms may only have a view of an interior air shaft. On the other hand, I've had them with a balcony and a view of the waterfront. The two beds will be small, the sheets and pillow minimal or slightly rough. The hotels desk may not be staffed other than during day time hours. In the rural areas, the English of the staff may be basic.Greeks are not prodigious drinkers - tippling is traditionally meant to accompany food - though since the mid-1990s a whole range of bars and pubs has sprung up, both in tourist resorts and as pricey music halls at the outskirts of the major towns in Greece Except at the growing number of luxury facilities in new or restored buildings, Greek hotels and pension rooms can be box-like, campsites offer the minimum of facilities, and the food at its best is fresh and uncomplicated. To attempt an understanding of the Greek people, it's useful to realize just how recent and traumatic were the events that created the modern state and national character - the latter a complex blend of extroversion and pessimism, which cannot be accounted for merely by Greece's position as a natural bridge between Europe and the Middle East. Greeks, despite nearly three decades of democratic stability and the country's integration into the EU. The poverty of, and enduring paucity of opportunity in, their homeland long frustrated talented and resourceful Greeks, many of whom emigrated. Those who stayed were lulled, until the late 1980s, by a civil-service-driven full-employment policy which resulted in the lowest jobless rate in western Europe. The downside of this was an occasionally staggering lack of worker initiative, but official attempts to impose a more austere economic line are still often met by waves of strikes. Since the early 1990s, Greece has become fully integrated into the Western economy, privatization and competition have demolished state monopolies, and inevitably growing disparities in wealth have appeared. Though younger Greeks are adaptable and cash registers ring happily, at least in tourist areas, visitors still need to be sensitive in their behaviour towards the older generation. The mind boggles imagining the reaction of black-clad elders to nudism, or even scanty clothing, in a country where the Greek Orthodox church remains an all-but-established faith and the self-appointed guardian of national identity. Although senior clerics have recently depleted a huge reservoir of respect with regressive stances on a number of issues, even the most worldly young Greeks, who never otherwise set foot in a church, are still likely to be married, buried and have their children baptized with Greek Orthodox rites. 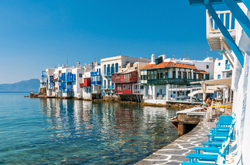 Most places and Greek people are far more agreeable, and resolutely Greek, outside the peak period of early July to the end of August, when soaring temperatures, plus crowds of foreigners and locals alike, can be overpowering. You won't miss out on warm weather if you come in June or September , excellent times almost everywhere but particularly in the islands. An exception to this pattern, however, is the north-mainland coast - notably the Halkidhikí peninsula - and the islands of Samothráki and Thássos, which only really cater to visitors during July and August. In October you will almost certainly hit a stormy spell, especially in western Greece or in the mountains, but for most of that month the "summer of Áyios Dhimítrios" (the Greek equivalent of Indian summer) prevails, and the southerly Dodecanese and Crete are extremely pleasant. Autumn in general is beautiful; the light is softer, the sea often balmier than the air, and the colours subtler.December to March are the coldest and least reliable months, though even then there are many crystal-clear, fine days, and the glorious lowland flowers begin to bloom very early in spring. The more northerly latitudes and high altitudes of course endure far colder and wetter conditions, with the mountains themselves under snow from November to May. The mildest winter climate is to be found on Rhodos, or in the southeastern parts of Crete. As spring slowly warms up, April is still uncertain, though superb for wild flowers, green landscapes and photography.